Sometimes you can only pass through an interesting area and vow to some day undertake that oft-promised yet elusive return journey. 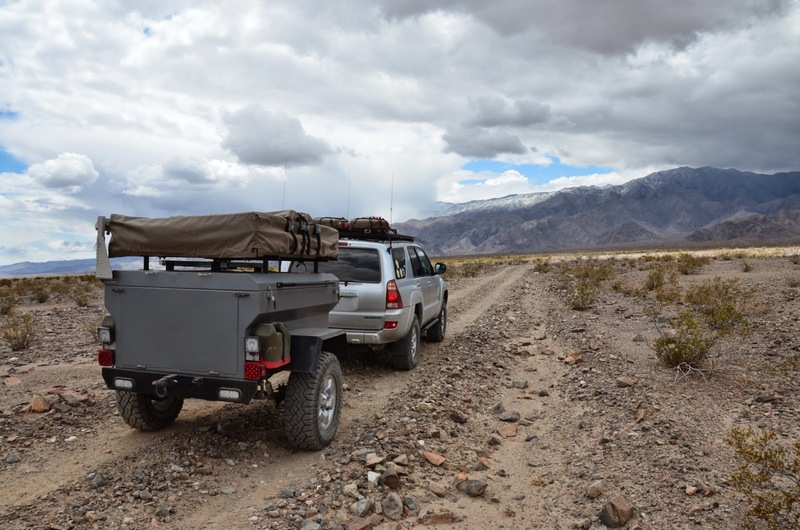 After so many times transiting the paved road through Panamint Valley for other adventures the time came to keep the promise and return to explore. This trip was planned to focus on a particular canyon and enjoy both the history and natural beauty it offered. In the weeks leading up to the trip the weather forecasts would frequently contradict the previous days' guesses and finally settled towards an initial wet front on Thursday leading to warmer temperatures on Sunday. In this picture you can just see the light snows on the mountains as I pointed the truck and trailer towards my off-road destination. This area is no secret but has been vandalized so much that I just can't add to the damage by showing maps or coordinates even though Jeep guides call the area out. I am sure that the old hands who specialize in this area will easily recognize where I stayed. The route is straightforward enough and it is best to take the most direct route. Old maps may promise a longer and more interesting off-road route from the south but those are no longer viable. 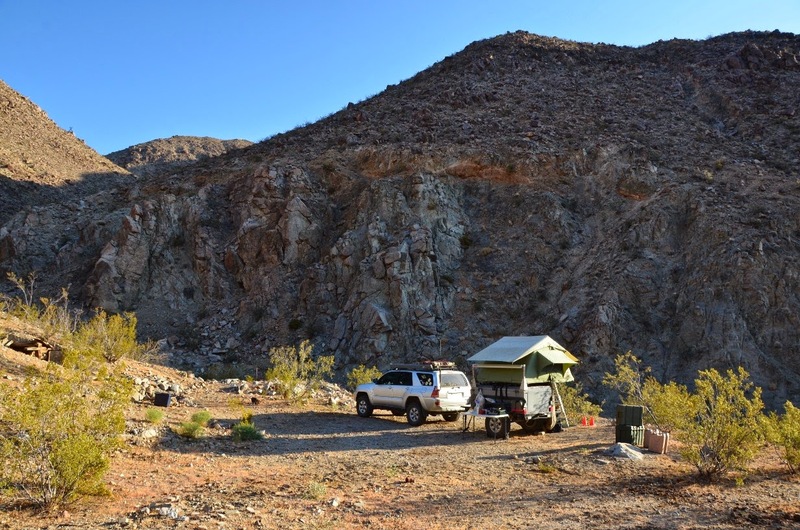 After a nice drive up to and into the canyon the first order of the day was to set up camp. What a great location to set up the trailer! All of my exploration would be on foot so no need to start the truck's engine. The 60 watt solar panel can easily keep the truck's batteries fully charged. High up above camp the feral donkeys (burros) roamed as they sought out low quality scrub to eat. They will serenade you with their raucous braying whether or not you find any appeal in the noise that one religion attributes to a donkey catching sight of Satan! 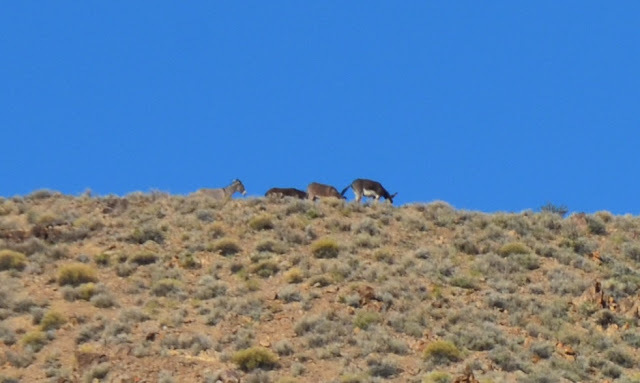 Below is an extreme telephoto shot I cropped to highlight these long lost relatives of the African wild asses as they foraged along the rugged mountaintops. I love how miners solved engineering problems with both high tech and elegantly executed low tech. One such example can be seen in these photos of a tramway tower that utilized carefully stacked local rocks instead of a massive amount of featureless cement. I took a series of photos starting from well below the tram tower at the start of a hike to well above the tower once I was at the termination of where the cable once ran. At times it blended in too well with the background and was difficult to spot. This particular hike was the highlight of the trip for me as the trail predated the roads for motorized vehicles and once rang with the steel on rock sound of the donkey's hoof protection. 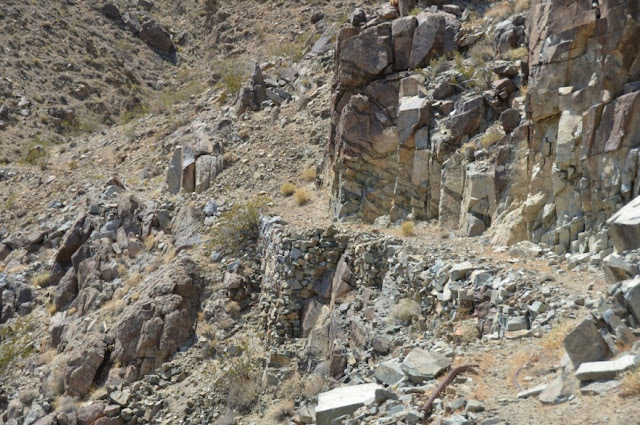 Clinging precariously on the canyon's walls were many tamped earth sections held up by sturdy rock buttresses that allowed both miner and donkey to transport numerous heavy loads. Finding the start of the trail was a bit tricky and I literally walked right by it. Erosion and rockfall have obscured it but once you spot the reinforced trail it traces a gentle upward grade leading to amazing views. One such view was down into the canyon where I set up camp, affording a rare aerial view of my expedition trailer and 4Runner. On my side of the canyon was a weathered tram tower displaying the rich colors of old timbers no longer burdened with the weight of the ore carts. Far ahead of me on the canyon wall I could make out an ore hopper with some sort of mechanism fastened to the front, harkening images of a large clock mechanism. In some areas the trail has eroded to a mere memory of the well built donkey path it once was. In other places the rock buttresses stood tall and resolute against time. Once close enough to the ore hopper to examine the gears it revealed some clever engineering that allowed the pieces to be broken down and reassembled on site. 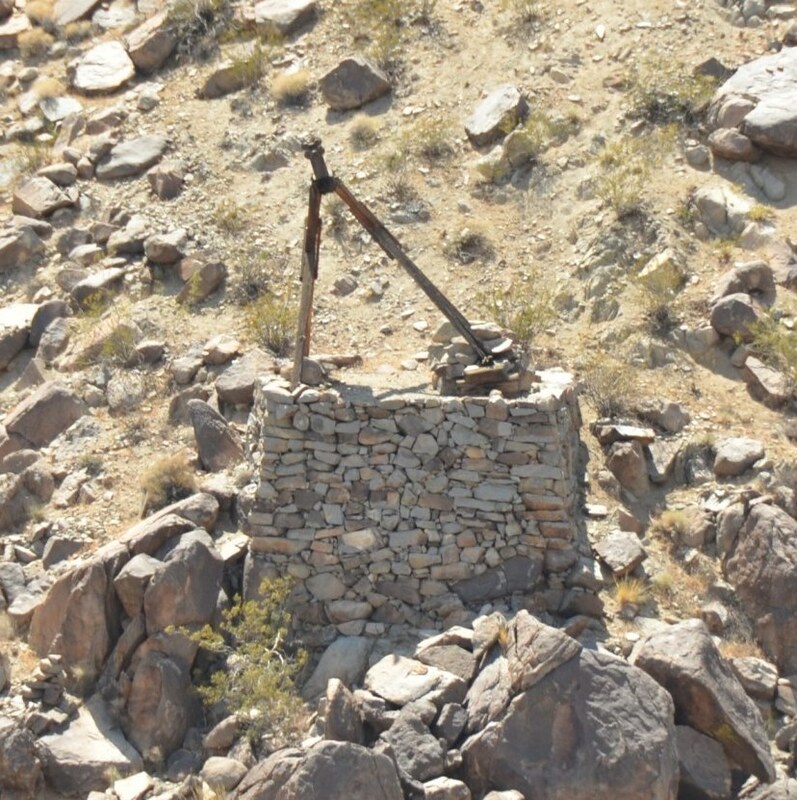 I can only guess that this was part of the system that powered the tramway and loading of the ore buckets that sailed through the dry desert heights back to the lower canyon's ore hopper and mill. I am always fascinated by the construction of tanks utilizing heavy rivets and wonder how in the world they transported these from the mining road (built nearby in later years) to the mine site.. The same question for this heavy remnant of an air compressor station. Soon it was time to hike back down the precariously perched miner's trail and enjoy an evening meal by the warmth of the campfire. The next day brought the need to clean up the campsite and pack away all of the gear before heading back to the pavement. I hope that you have enjoyed this brief glimpse into one of the many areas of Panamint Valley that offers so much to see and do if you are willing to get out there and explore! See you on the next adventure. Nice trip and thanks for pointing out good stewardship ethics. We are so lucky to have wonderful places to explore. Good stuff. 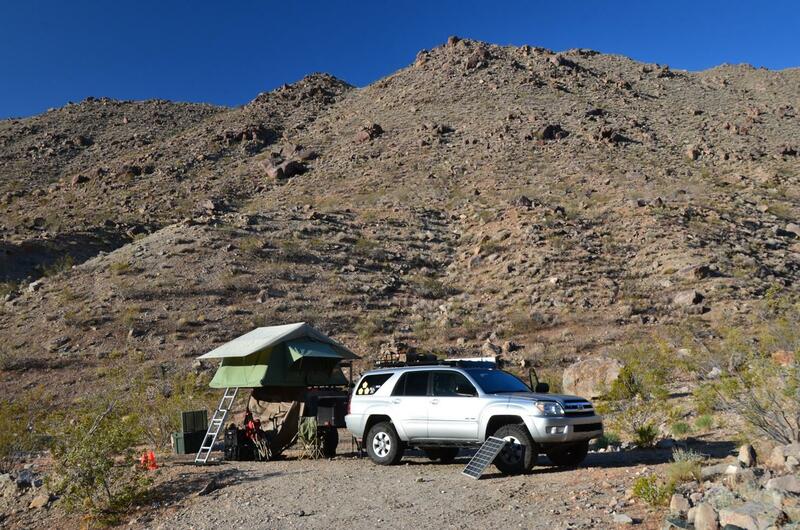 I'm actually trying to figure out what kind of roof rack you have on your 4Runner there. I dig it.